The pairing of violin and flute has a long history. During the Classical period, flutes doubled violin melodies in order to cast them in a brighter timbre. In modern ensembles the two voices generally take on independent roles to establish timbral contrast in the upper voices and to maintain more open textures. With the addition of electronics and the potential multiplication of voices they afford, the possibilities available to violin and flute both in tandem and separately broaden considerably. 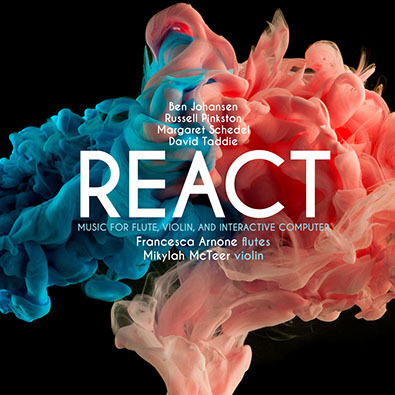 The compositions on React, a collection of new music for violin, flute and electronics by American composers Ben Johansen, David Taddie, Russell Pinkston and Margaret Schedel, bring many of these possibilities to realization. The music came together during November, 2014, when violinist Mikylah McTeer and Taddie, who are on the faculty of the West Virginia University School of Music, went to the University of Texas, Austin and Baylor University for residences. While there, they collaborated with flutist Francesca Arnone of Baylor and the University of Texas’s Pinkston, as well as Baylor alumnus Johansen. New works resulting from the residencies were premiered at Baylor and Austin, and then presented at a concert at the West Virginia University Creative Arts Center in January, 2015. The WVU concert also included Stony Brook University’s Schedel. The recordings that appear on this CD—performed by McTeer and Arnone—are from the performances at Baylor and the WVU Creative Arts Center. Johansen’s two compositions Interact and React, scored for flute, violin and interactive computer, open and close the recording respectively. Both pieces incorporate indeterminate and improvisational elements, which are realized not only through the random effects of live processing, but through the interactions of the violin and flute as well. Interact is a strongly contrapuntal, consonant piece which uses processing to multiply the two instruments’ energetic, independent lines; React is a more subdued, slowly developing work that makes good use of negative space and low dynamics, as well as extended techniques such as air notes and percussive effects. Taddie’s Category 5 (Echoes) for violin and flute/alto flute/piccolo and computer arranges violin and flutes in separate but overlapping spaces, as if in juxtaposed soliloquies accompanied by an electronic, abstract orchestra made up of samples of the two voices. Vox Clamantis, an expressive piece by Pinkston, is stamped by a strong, modally-inflected sense of melody. Schedel’s QfwfQ (A Voice a Point of View) is named for the narrator of the stories in Italo Calvino’s Le Cosmicomiche and carries the kind of uncluttered, minor-key gravity appropriate to a story-teller as old as time. React includes three works for solo instruments. Taddie’s Luminosity for flute and electronics features a modally-evocative flute line accompanied by archetypically “electronic” sounds. Pinkston’s Lizamander for flute and electronics—a version of which, featuring Elizabeth McNutt on flute, was released on his recent Balancing Acts CD—is here, as is Schedel’s Partita, Perihelion for solo violin and electronics. This latter work, inspired by Bach’s works for solo violin and cello—Schedel, it should be noted, is a cellist as well as a composer—is, like the Baroque dance suite it’s modeled on, divided into movements for allemande, sarabande and gigue, the forms of which are interpreted in a free, and sometimes counterintuitive, contemporary manner. The gigue, for example, usually a very lively dance, is here played as a slow adagio. The Max/MSP program accompanying the violin, by adding a second voice, makes explicit the harmonies implied by the instrument’s line.